Space per pupil: 119 sq.ft. With an existing forest and wetland, significant slopes and a sprawling campus, the replacement of A.G. Bell Elementary posed challenging natural and built constraints. 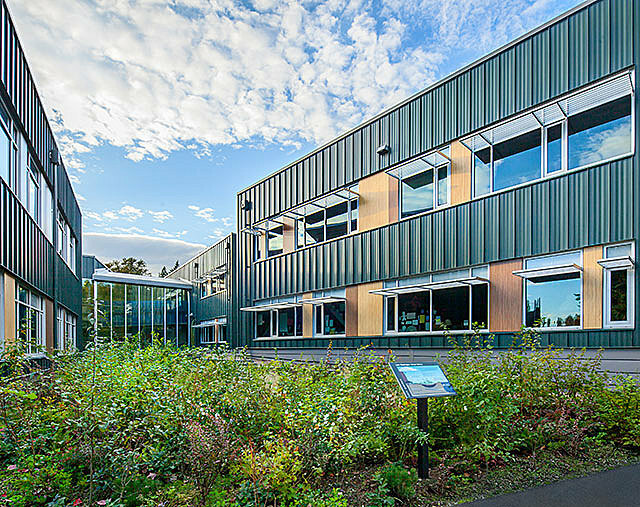 DLR Group’s design brings restoration to the fractured site by integrating its unique qualities in a school enabled to meet educational goals, sustainably reduce the cost of ownership and reinforce community connections. Featuring roof canopies and staggered elevation levels, the building complements nearby vegetation and maximizes daylight through sun shades, light-diffusing glass and deliberate orientation to further reinforce transparent learning environments. Additionally, the surrounding forest was left intact, requiring diligent phasing of the occupied site. In crafting the classroom pods, DLR Group listened carefully to the District advisory team, ensuring each classroom has equal access to shared space. 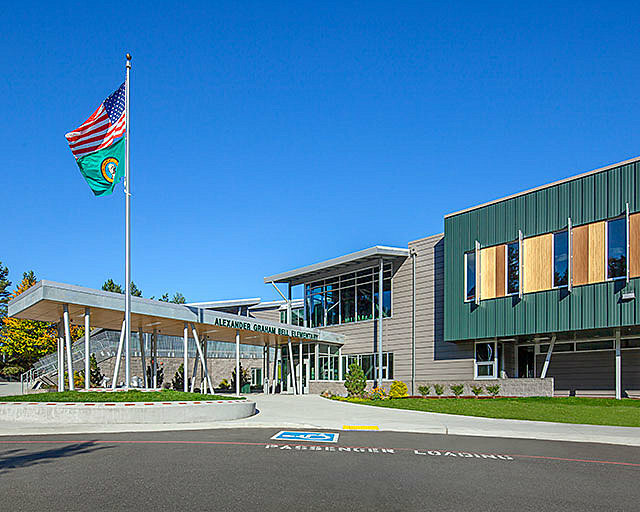 With a clear, welcoming entry, space designed for community and school use and fully integrated walking paths to surrounding neighborhoods and streets, A.G. Bell Elementary is now enabled to serve both its students and community. 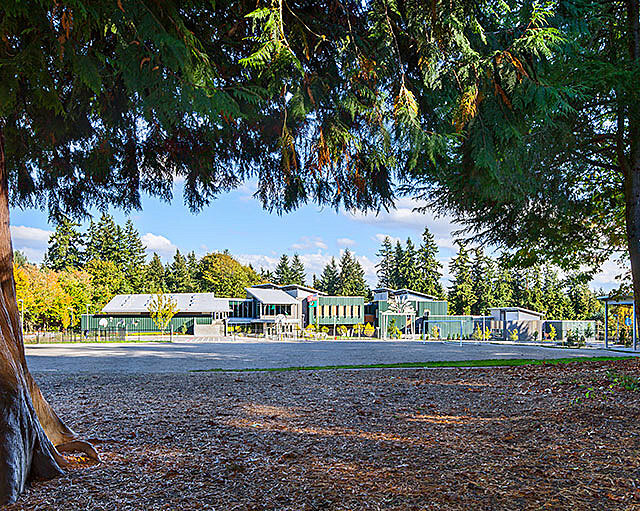 The partnership between DLR Group and the Lake Washington School District was seen to fruition in that exact manner: A partnership. Each side brought their talents, knowledge and desires to create a school to serve the community. Furthermore, the District was able to uphold its goals for the school, such as high sustainability with low maintenance. DLR Group implemented evolving District standards, encouraged the District to remain committed to energy goals, and balanced user group desires within District requirements. 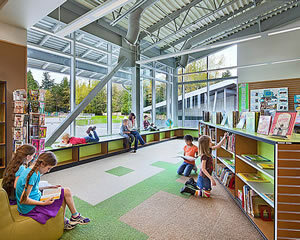 The design approach for A.G. Bell Elementary responds specifically to the three main areas (Challenge, Value and Connection) of Lake Washington School District’s goals. Challenge is one of integration; the whole must be greater than the sum of the parts, and efficiency and comfort must be balanced. The project must provide Value by meeting its energy goals, by responding to Total Cost of Ownership, by being flexible and the process must accommodate practical innovation. In terms of Connection, there must be a sense of place and a poetic contribution to the community. There is no doubt that the land on which A.G. Bell Elementary is situated was difficult to navigate. It has challenging grades and is surrounded by forests and wetlands. The topography wreaked havoc on the previous utility and hydrological systems. 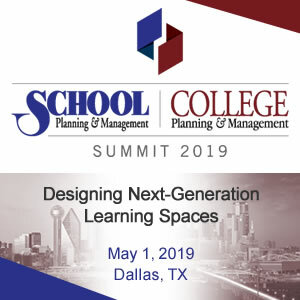 In designing the replacement school, DLR Group created a building and its systems to work in conjunction with the site, negating the need for time-consuming, expensive land reformation. A.G. Bell serves as an example that challenging site problems can be creatively and realistically solved. Additionally, A.G. Bell Elementary sits directly on the Kirkland Trail System, a novel feature which was disrupted with the previous site layout. Bringing restoration to an interrupted site, the careful planning of DLR Group was able to fully integrate the trail system, connecting the school with the surrounding community. By improving the paths, students enjoy increased walkability to and from school. The integrity of the site is enforced by thoughtful design, leaving natural features intact, and the bulk of the gym is set into the earth to reduce its impact to the site. Lake Washington School District also sought to provide appropriate community spaces while ensuring the appropriate separation of public and private spaces within the school. The focus on school transparency allows uninterrupted supervision from one end of the school to the other, and into publicly-shared areas. This success in providing safety and security to all occupants has provided ample space for community functions and after-school activities - giving the surrounding neighborhood a sense of belonging to the new facility. 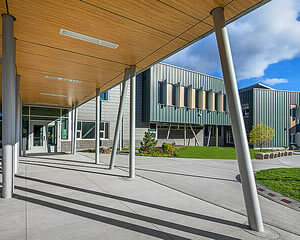 By creating a strong focal point around the school’s entry – both outside the building and within it — the indoor/outdoor commons creates a focal hub for community activity. Outside activities on the grounds of the school, or interior programs in the gym, cafeteria/performing arts space and library, occur almost daily. The District advisory team stressed the importance of equal access to shared spaces within the pods. 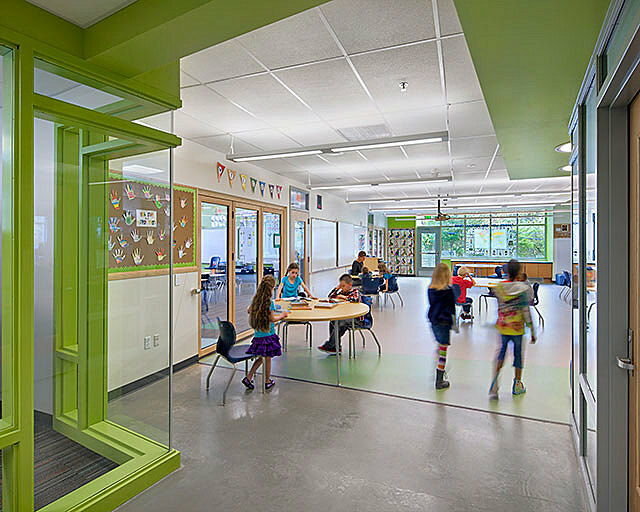 Implemented through transparent flexible nana-walls, teachers are encouraged to collaborate and utilize movable furniture and spaces to most-effectively deliver education. Within each four-classroom pod there are seven separate spaces available for teaching, varying in size for four to 30 students – each with multiple points of visibility and supervision. 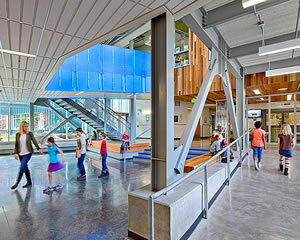 Additionally, each classroom is provided two edges of natural daylight. A.G. Bell’s library is given particular prominence in the school, clad in reclaimed cedar wood and hovering prominently above the lobby and administration office. 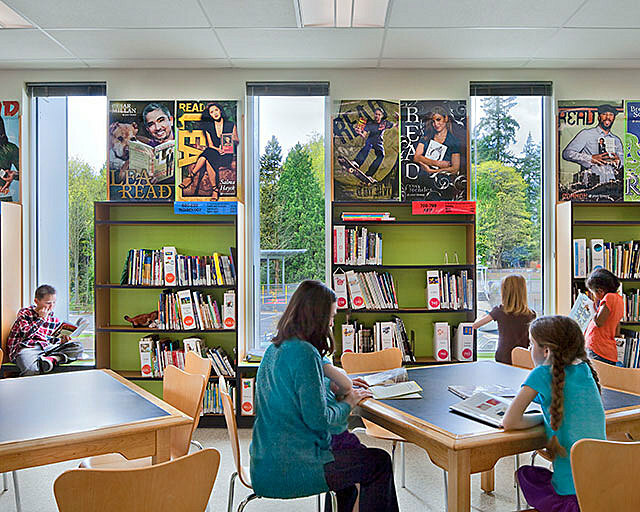 Both in the library and throughout the school, signs and markers allow the building to be utilized as a teaching tool — sharing information about materials, building systems, and structural components. 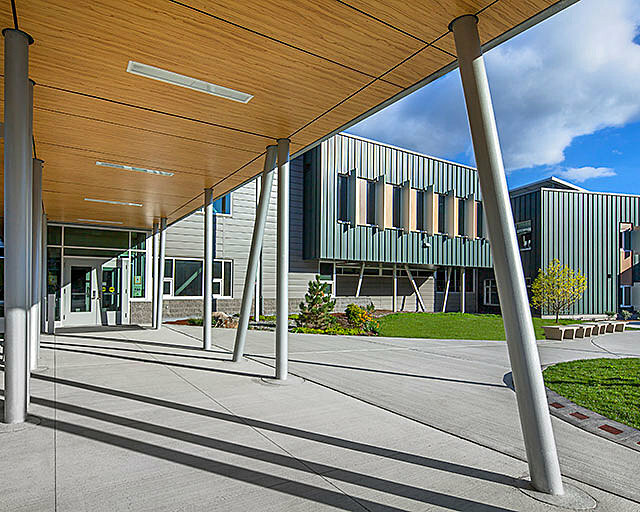 Per District standards, the school features durable, low-maintenance materials such as concrete floors, metal siding and galvanized steel, accented by warm wood accents and a color palette representative of the surrounding forest. The wood covering the school’s library is reclaimed cedar salvaged from the previous school. 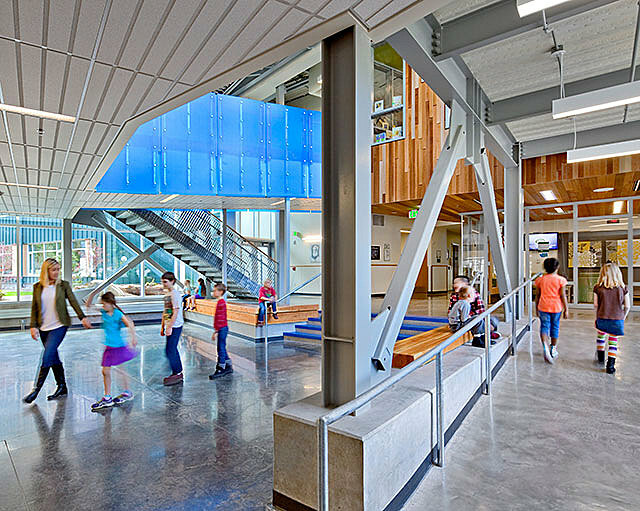 Exposed systems and signage throughout the building provide opportunities to learn and better understand the physical attributes of A.G. Bell Elementary. 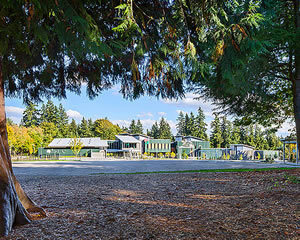 A number of sustainable technologies and strategies were drafted to make A.G. Bell exceed Washington Sustainable Schools Protocol (WSSP) criteria. Fitting the school into the site without disturbing the existing topography was of paramount consideration. The surrounding forest was left intact. Sustainable technologies include solar panels, high-efficiency boilers, rain gardens, sun shading, light diffusing glass, and deliberate orientation that allows for maximum sun control and daylighting. Additionally, interior walls surrounding the library are covered with salvaged wood from the former school building. A.G. Bell Elementary was fully operational throughout construction — a task that required diligent phasing and preparation of site work. By constructing (and temporarily enclosing) the covered play first to utilize it as a gym, demolition and construction moved forward in strategic phases — ultimately reconfiguring the school’s orientation and allowing the best use of a unique site. Participating stakeholders were brought into the design process on three different levels to allow for successful buy-in and fulfillment of user group desires. The Leadership Group met on a frequent basis to finalize big picture decisions, budget, schedule and quality. The Design Advisory Committee was comprised of faculty, staff and community members to advise on school-specific criteria such as culture and implementation of District-level standards. Broad touch-points were made with the greater community on multiple levels at a design-share open house, and again at events such as the A.G. Bell Elementary School picnic. During the course of construction, there were two changes in leadership, concluding with a new Principal at A.G. Bell Elementary, Heidi Paul. A.G. Bell is a school that is prepared for the future. Education, like many things, is evolving rapidly, and schools cannot lag behind one another for generations; they must be created to adapt with the times. Modernizing A.G. Bell meant making it future-ready, a goal of the District. The planners included a significant degree of transparency in all of the spaces, allowing for multiple uses and group interaction. The mechanical and electrical components were also designed and located to allow interior walls to be easily rearranged in the future to match the educational requirements of coming years. There is no doubt, years into the future; the school will grow organically with changing programming and functional needs. General Contractor: Cornerstone General Contractors, Inc.
Acoustical Consultant: SSA Acoustics, Inc.